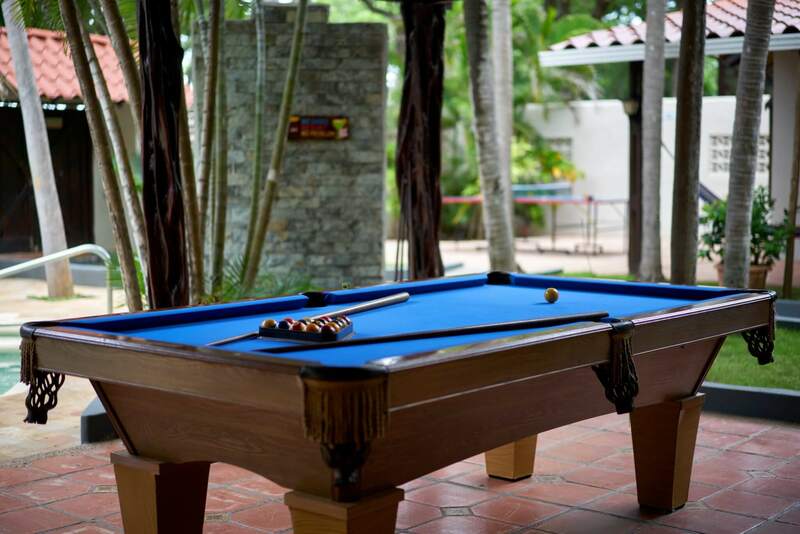 This area is built under the cover of a majestic ceiling and enjoys beautiful views over the swimming pool and BBQ area, as well as to the tropical gardens and Pacific Ocean. The area is open-sided making it very easy to access from all parts of the house, and also keeping it very fresh and serene with cooling sea breezes that flow in from the ocean. As the open-air living room overlooks the swimming pool, young children can be monitored at all times. 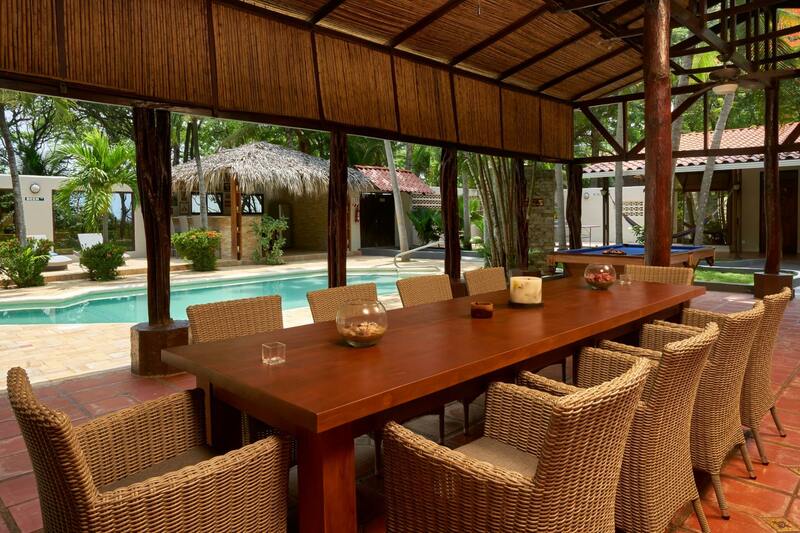 The personally designed wooden teak dining table seats up to 14 guests, and has very comfortable rattan chairs with cushions. 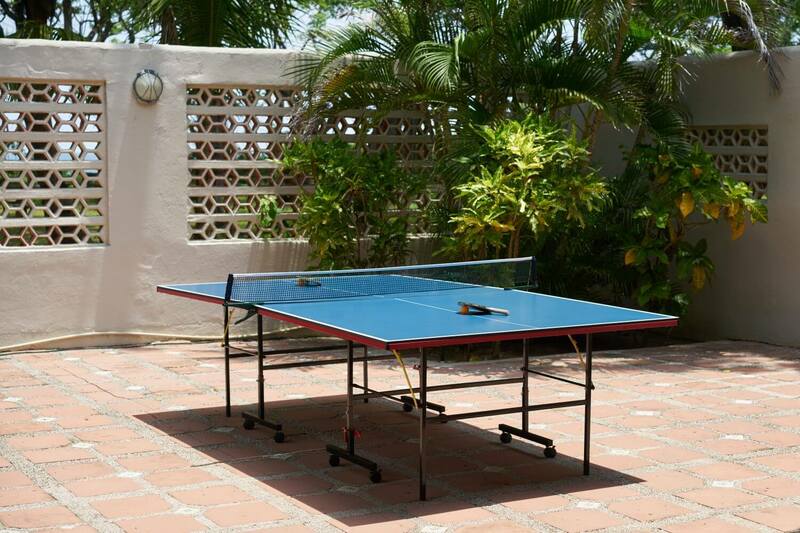 An auxiliary table and chairs are available for extra guests.Two baby highchairs are provided for guest use. The television area features a 47-inch flat screen TV and a set of rattan sofas and armchairs that can seat up to six guests comfortably at a time. Another separate area has also been added with a designer chaise lounge sofa where guests can relax, read or simply enjoy the calming swimming pool and ocean views. Designed to a very high spec, the sofa seats up to six people comfortably and features stylish sky blue cushions for lounging. 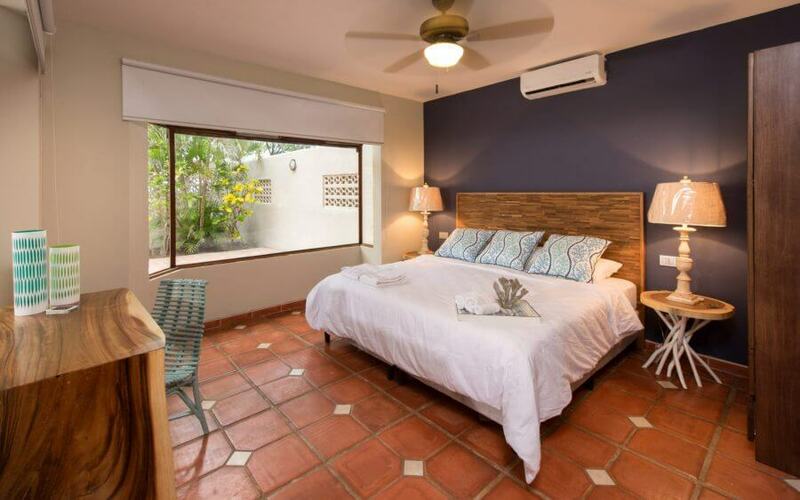 Casa Serena offers five large bedrooms that can sleep a maximum of 18 guests at a time. 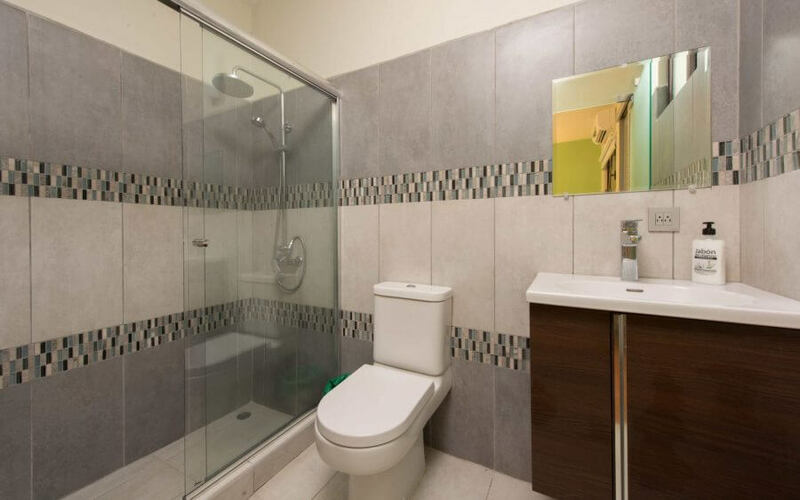 The bed linen and towels provided are of the highest quality and all bathrooms are fully equipped with showers and have been designed using the highest grade of spanish tile. 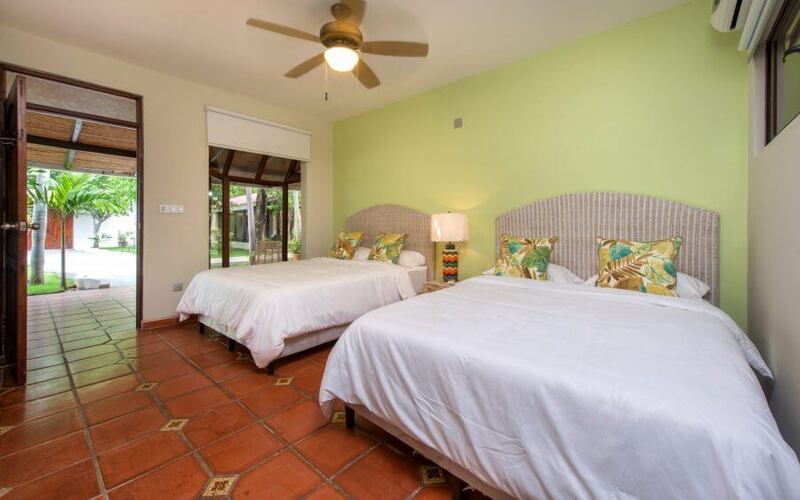 Baula is the largest bedroom in Casa Serena and the only one that has a king size bed. 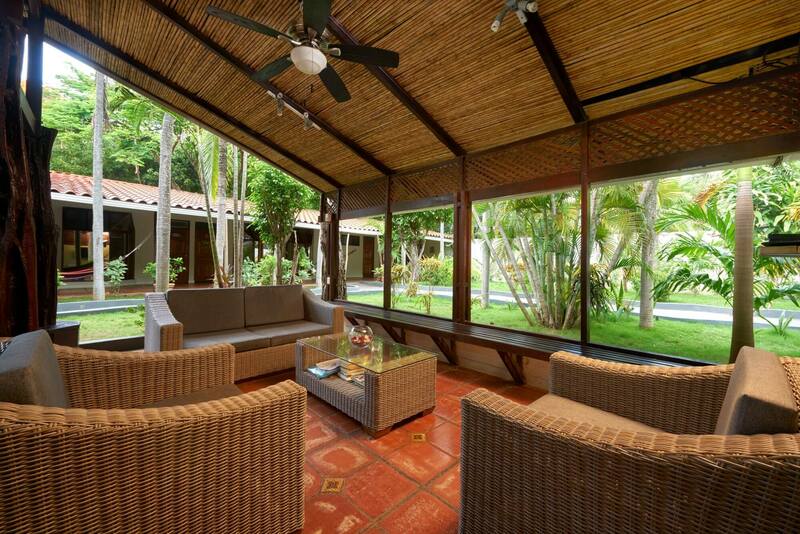 Named after the famous Baula Turtle, the room enjoys direct views to the swimming pool and ocean. Natural sunlight flows in through its two large bay windows, which are fitted with special curtains that block the sun so that the Costa Rican 5am sunrise does not wake guests up in the morning should they want to sleep in. It is a very cozy bedroom, painted in calm colors that enable you to relax and enjoy everything it has to offer. The king size bed and pillows are of the highest quality and the fine white linen sheets allow guests to enjoy a comfortable sleeping experience. 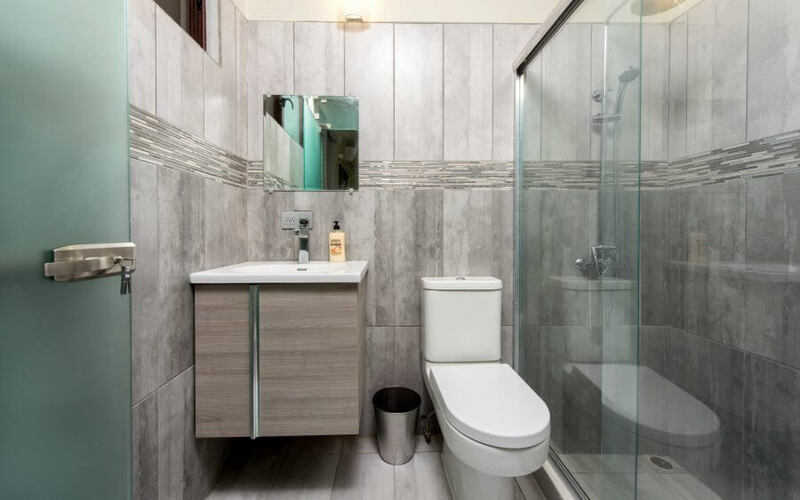 The ‘zebra’ bathroom has been designed to the highest standards and features a spacious shower area where guests can take an exhilarating shower after spending the day at the beach, pool, playing golf or other adventures. 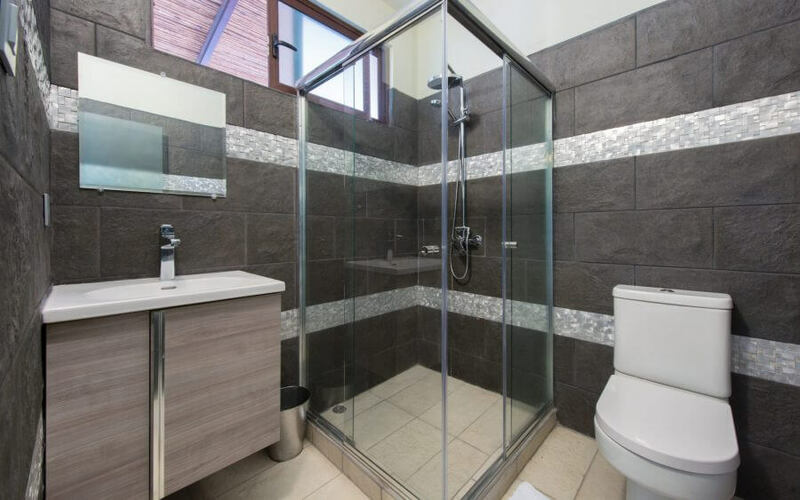 The door that separates the bedroom from the ensuite bathroom is made of tinted security glass that gives the room a modern touch complementing its rustic features. The bedroom is fitted with a safe with key in which to place your valuables and a fully installed AC unit. Guacamayas are long tailed colorful parrots that live in Costa Rica and other Central and South American countries. This beautiful room has two queen beds that comfortably sleep four adults. 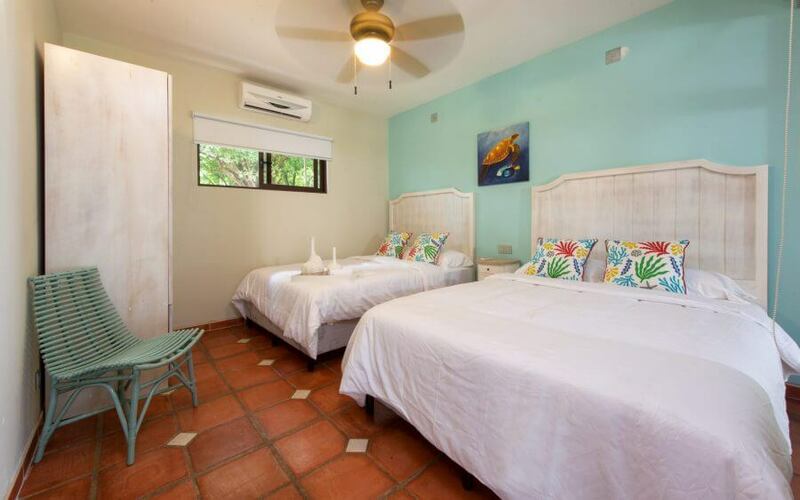 The walls are painted in warm colors that match the design of the headboards, resembling the clear blue sky of Playa Grande. The door separating the bedroom from the ensuite bathroom is of tinted security glass, which makes the room look modern within its other rustic features. The bathroom has a very contemporary design with unique black tiles combined with silver strips. There is plenty of cupboard space to store toiletries and the large window allows natural light and fresh air to come in. Guacamayas also features spacious wardrobes, a safe with key and is a fully installed AC unit. 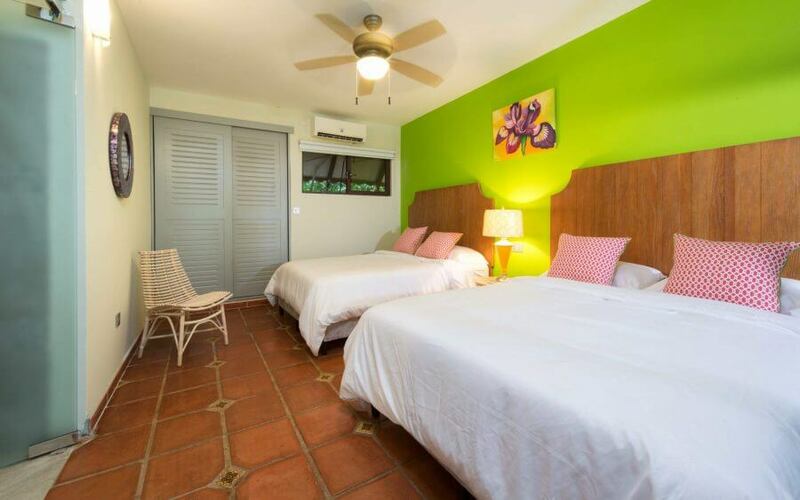 Named after the popular, colorful and friendly Gekko lizard that lives in Costa Rica, this room has been designed with bright and friendly colors giving it a very warm and cozy atmosphere. The two queen-size beds sleep four adults very comfortably. The large bay window means that this room receives lots of natural light so that guests can appreciate the true beauty of the color scheme and the decorative rustic clay tiles on the floor. The door that separates the bedroom from the ensuite bathroom is made of tinted security glass, which makes the room appear modern within rustic features. 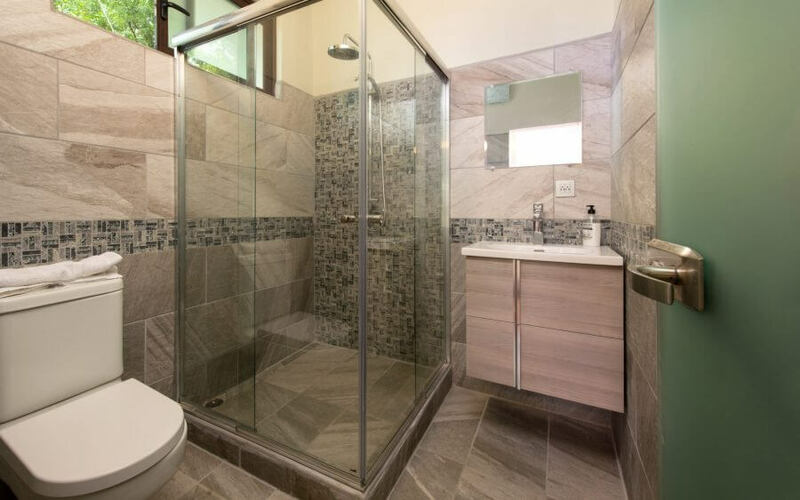 The bathroom is bright and has been designed using exclusive Spanish tiles. Gekko features lots of wardrobe space, a safe with key and is fully installed with air conditioning. 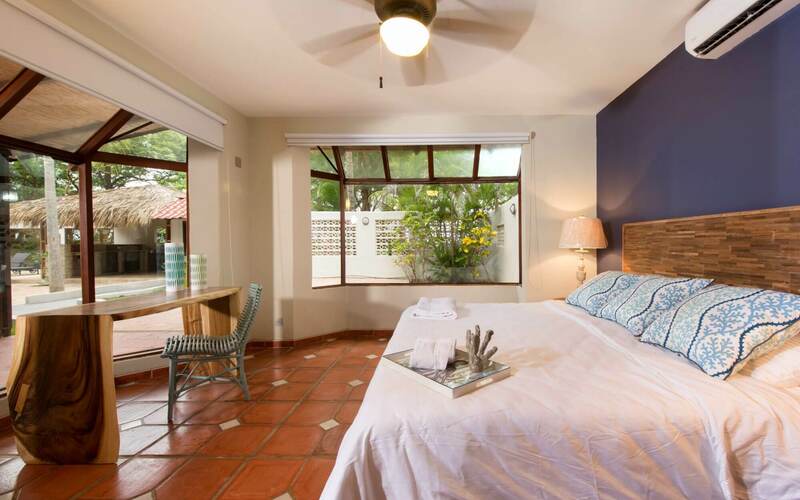 This beautiful room has been named Cariblanco after the famous Costa Rican white-faced monkey that lives amongst the tall trees of this beautiful country. A very spacious and bright room that comfortably sleeps four adults in the two queen-size beds features exclusive rattan headboards and high quality mattresses so that guests can enjoy a good night’s sleep. The rustic clay tiles on the floors, with decorative smaller tiles placed in between blend perfectly with the tropical feel of the room. The door that separates the bedroom from the ensuite bathroom is made of tinted security glass, which makes the room look modern within its rustic features. The bathroom has been designed using a stylish Spanish tile that fits perfectly with the decoration of the bedroom. Cariblanco features large fitted wardrobes, a key operated safe and is fully installed with air conditioning. 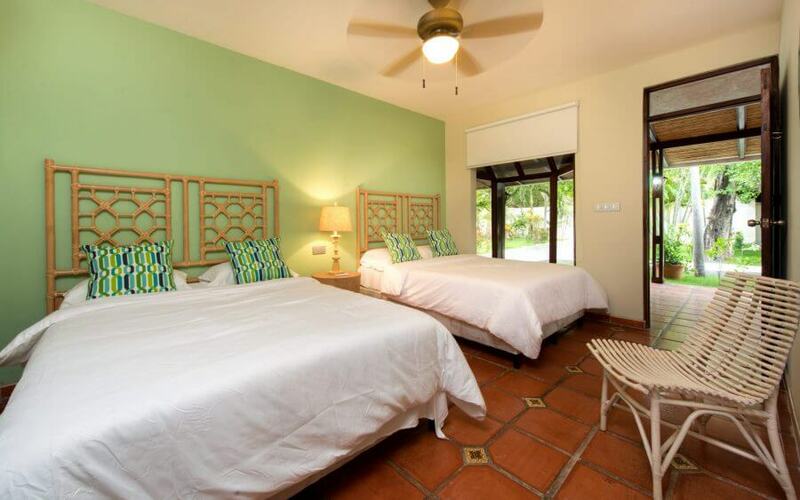 Guaria is the national flower of Costa Rica, which is why this bedroom has been designed in fresh colors to resemble nature as much as possible, creating a very tranquil and relaxed atmosphere. The room features two queen-size beds that sleep four adults, with quality sheets and pillows to ensure a good night’s rest. 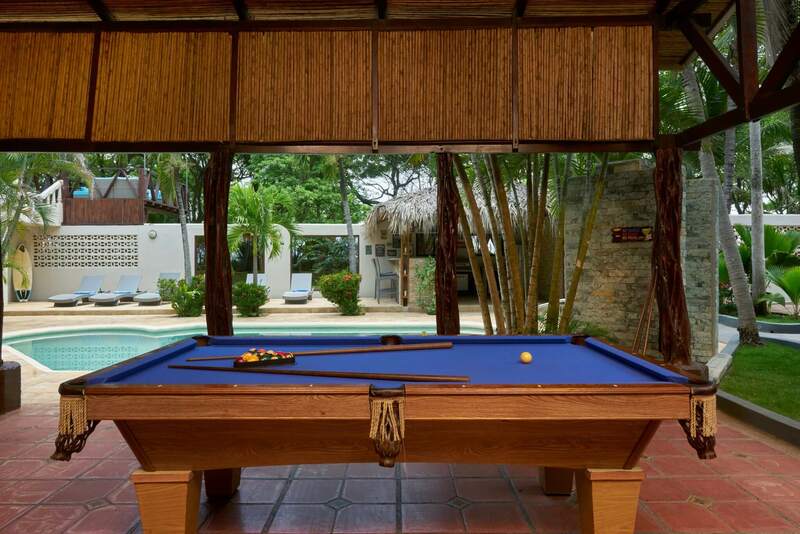 Guaria is located at the end of the house, making it the most private bedroom of all. The clay tiles on the floors, with decorative smaller tiles placed in between, gives the room a rustic and warm feeling. The large bay window allows natural light to enter the bedroom, making it very cozy and bright. 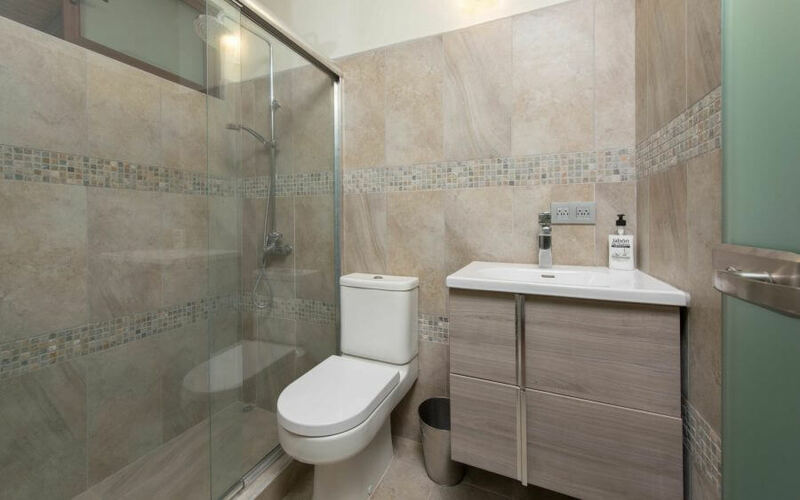 The bathroom has been designed in beige tones resembling Roman thermal baths and there is plenty of cupboard space to store toiletries. Guaria offers spacious a wardrobe to fit all your clothes and shoes, has a safe with key and is fully installed with an AC unit. 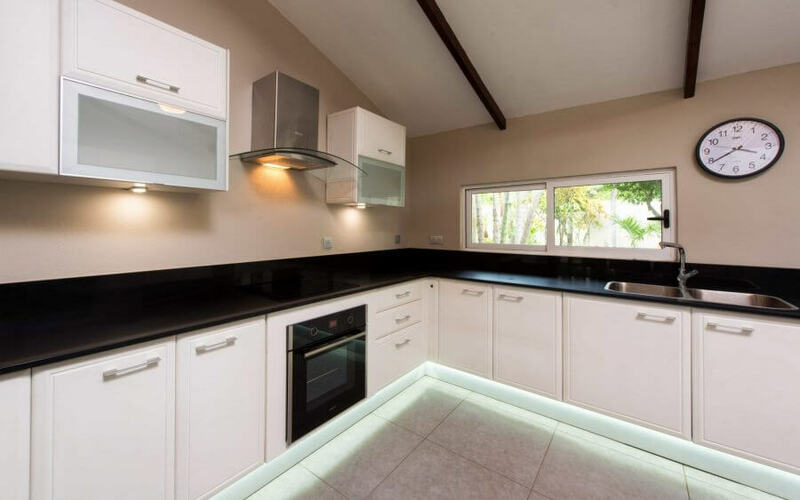 Built to the highest specifications and with top end appliances, the kitchen includes a large American fridge, cooker, oven, microwave, dishwasher and all the necessary cooking equipment, glassware and eating utensils needed to accommodate 18 guests. The floor is of a high quality dark grey tile that blends perfectly with the white furniture and black quartz countertop. 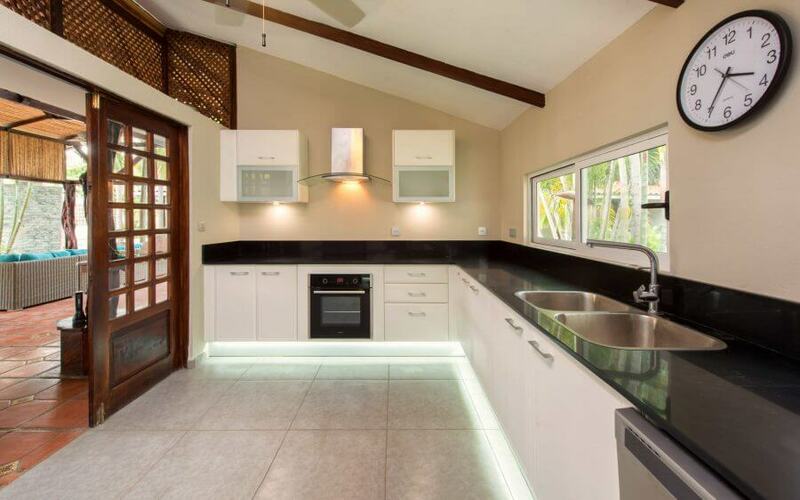 Two large sliding windows that overlook the lush gardens, allow natural light to flow in, making the kitchen a very bright and comfortable space to be in. The kitchen is connected directly to the outdoor living room through two large glass paneled wooden doors. The private laundry room adjacent to the kitchen contains a washing machine and separate dryer for guest use. 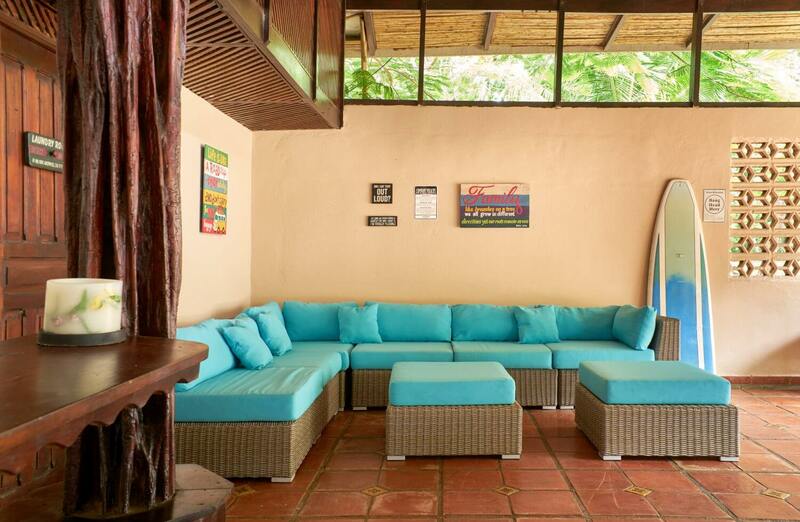 If guests prefer, there is also an enclosed area to hang clothes to dry naturally under the Costa Rican sun.